FOAM n. 47, contains a commentary by David Campany on Issue 12 (1933) of USSR in Construction, the Stalinist propaganda magazine. 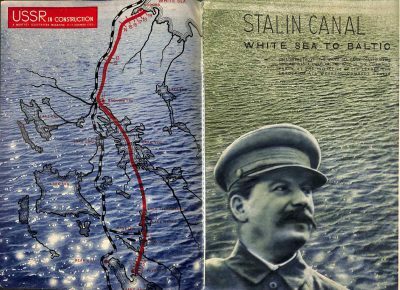 This issue was dedicated to the building the Baltic White Sea Canal, and was photographed and designed by Alexander Rodchenko. The monthly illustrated USSR in Construction (1930-1941) was the flagship publication of Joseph Stalin’s Soviet state. Issued in Russian, French, Spanish, German and English editions, it was one of the most spectacular and influential propaganda magazines of the last century. It channelled the graphic and photographic innovations of the avant-garde that had emerged in the 1920s, deploying huge budgets to visualize industrial might and progress. Its photographers, writers and designers remain the most well-known of the Soviet era, although USSR in Construction may not be the work for which we prefer to remember them. Figures such as Alexander Rodchenko, El Lissitzky, Varvara Stepanova, Soloman Telingater and Valentina Khodasevich began their creative lives in the wake of the 1917 Russian revolution. Under the banner of Constructivism, they forged bold new directions in everything from painting, photography, film and page layout to industrial design, sculpture, theatre, architecture and poetry. Rejecting the tried and tested, they experimented freely with the new technologies and materials of the modern age. By the time the first issue of USSR in Construction appeared in 1930, Stalin had already denounced the Constructivists as bourgeois. However, he retained their graphic innovations, because pictures in extravagant layout could communicate with a population that was still largely illiterate. The magazine’s text was minimal, its pages dominated by a swirling interplay of photos and graphic devices, with elaborate foldouts and colour overlays. Alexander Rodchenko was particularly versatile. He had started as a painter but produced ground-breaking work in many fields of art and design, becoming the key spokesman for the experimental and revolutionary ideas of the 1920s. But in the following decade he came under enormous state pressure. He contributed to several issues of USSR in Construction, both as a photographer and graphic designer. Issue 12, from 1933, was almost entirely his work. It showcased the building of the Baltic-White Sea Canal, the largest civil engineering project of the period. It made a continuous 227km transport route connecting the White Sea to the Baltic Sea, via Lakes Onega and Ladoga. In reality, life ended here for many of them. Workers were grouped in gangs and forced to compete for better conditions, and shorter prison sentences. Digging away at the rock, often with primitive of tools, they were pushed to their limits with no medical care. Official Russian records indicate nearly 12,000 died during the project. The higher estimate is 25, 000 deaths. The canal is still operational, although at only 3.5 metres deep it cannot carry today’s larger vessels. Rodchenko’s mastery of the page spread was extraordinary. His overt montages (Stalin against the glistening waters) distract from the less obvious examples. The photographs still have the pioneering angles with which he had learned to make the familiar strange, but the formula is clear – heroic workers struggling against the odds in epic landscapes, directed by visionary leaders. In later issues, montage was eliminated to leave images of soldiers, handshakes, factory openings and happy farmers. Between its first issue and its last, USSR in Construction charts the crushing of experimental design under the dead hand of Socialist Realism. Rodchenko soon fell out of favour but, somehow, he survived the climate of continuous purges. He spent his last years in obscurity, making abstract expressionist paintings. He died in 1956, three years after Stalin. Nothing dates faster than propaganda. It is a relentless arms race fought against fact. This makes it particularly easy to look back with hindsight and see clearly its crude manipulations. Or rather, it is easy to see this after the regime has failed. It is failure that permits hindsight. But regime failure happens only when we fight its propaganda in the present… when we refuse to allow the annihilation of our critical thinking.